Artists and scholars will be invited to produce new work at the center. We will consider inviting and selecting applicants from varied geographical, social and cultural backgrounds to include local applicants from the Bay Area and Santa Cruz County; National applicants from across the country; and International applicants. Our visiting artist program will support artists and scholars in carrying out innovative projects by providing them with up-to-date resources and a well-equipped studio space at the center. UCSC students will interact and participate in each visiting artist’s project. A group of selected students will assist in the completion of edition projects under faculty supervision and with the visiting artist’s/scholars guidance. By participating in professional practice of artistic and scholarly research students will acquire unique working practices and knowledge of divers skill sets, while also gaining cultural exposure of the unique individuals selected to participate in the program. 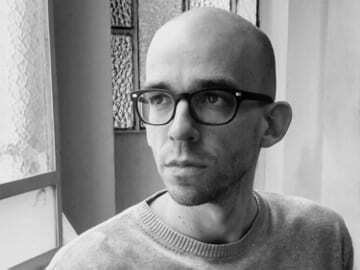 Our forth visiting artist Tobias Crone will be working on his new print and drawing projects at the center from April 10 through May 13, 2019. After growing up in the swamps of the Northern German province, Tobias Crone studied printmaking at the Art Academy of Groningen in the Netherlands. 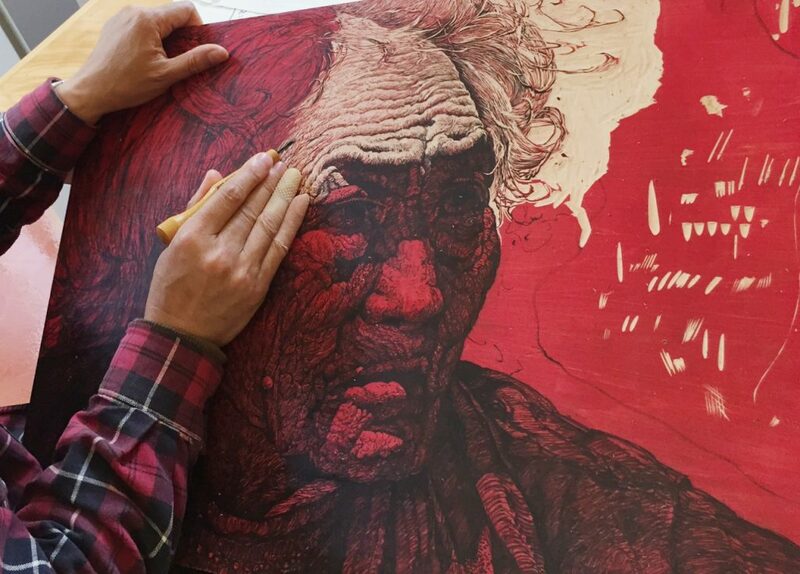 Having suffered some short but intense romantic affairs with animation movies, installations and theatre, he managed to stick to his true love called intaglio printmaking, once introduced to him by his good ol’ pal, the pencil. During his stay in Buenos Aires from 2012 to 2017, he began working on a series called ”Person Separation Device“: detailed figurative etchings, aquatints and drawings, the majority of them large monochrome prints with subtle color accents. These works depict fragile persons that get united through the “Person Unification Device” (an object that resembles a mattress), then travel together through a world of desolate swimming pools and tiled bathrooms, and at the end, enter the “Separation Device" (technically a turnstile). 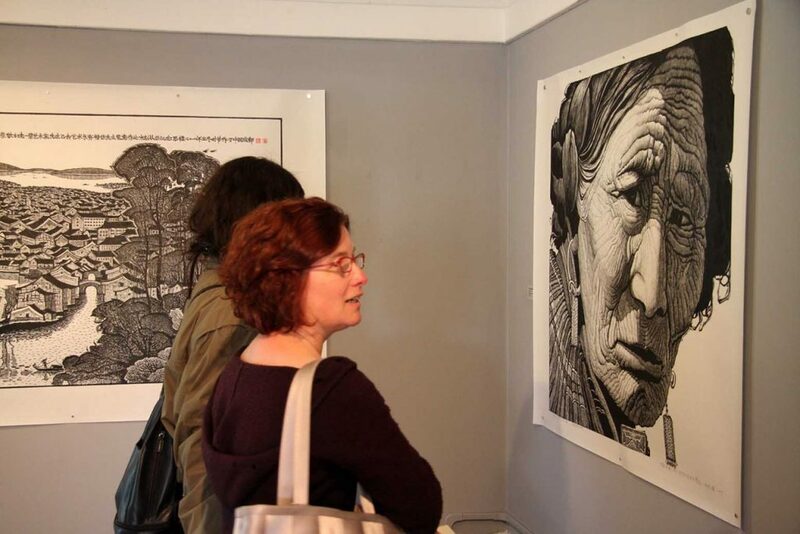 displayed in various exhibitions around the world and received distinctions like the CIEC Foundation Grant 2018 (Spain) or the 2nd Prize of the Manuel Belgrano Printmaking Award (Argentina). Our third visiting artist and an UCSC alumni Israel Campos, will be working on his new print projects at the center from April 30 through May 25, 2018. Israel plans to develop a body of work utilizing multiple print processes including photo-etching to explore the contemporary cultural landscape of Santa Cruz and the transformation the city has undertaken since he last visited the city as a student. Cities across the country are experiencing a transformation driven by an affluent class. Israel plans to investigate if Santa Cruz is experiencing some of the drastic changes currently underway in Los Angeles. Israel Campos is a California born artist currently living and working in Los Angeles. His work primarily draws from his experiences living in Los Angeles as well as from Mexican traditions, and contemporary social issues. 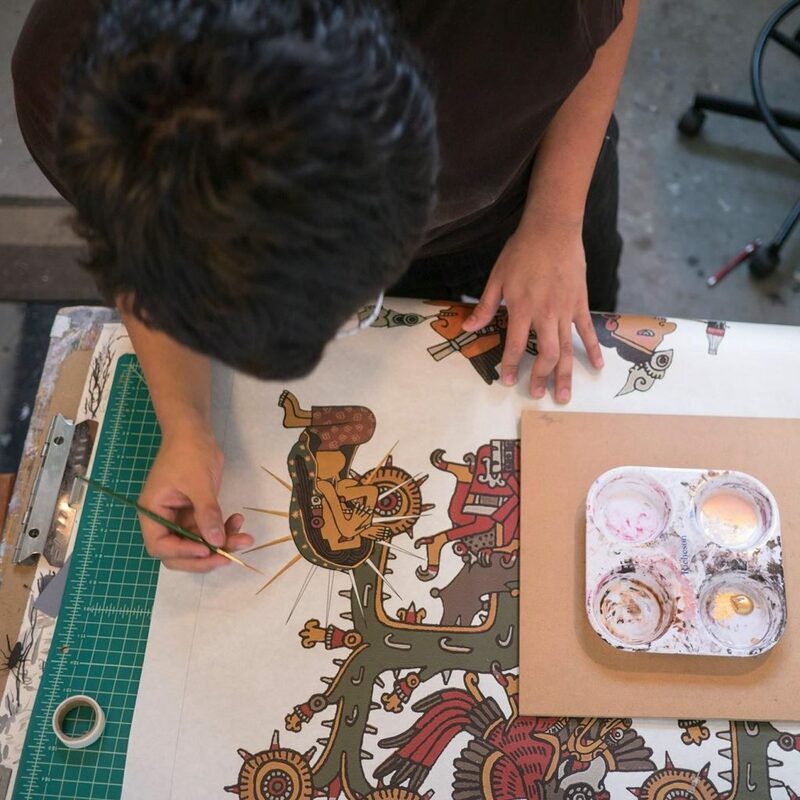 His is heavily influenced by his upbringing in a community of first generation Mexican immigrants and the relationship of his community with an ever-changing urban landscape. The L.A. he draws from is heavily industrial and predominantly working class. The sunshine and palm trees of the city are backdrops to sewing machines and 18 wheelers. Israel synthesizes and explores American and Mexican Cultures in his work as a reflection of the same cultural fusion happening throughout Los Angeles. 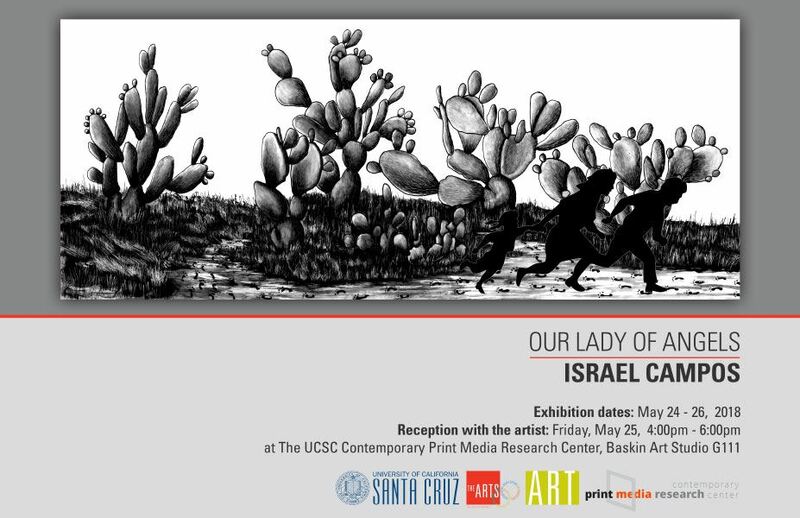 Israel graduated from the University of California Santa Cruz in 2011 developing his practice as a print media artist. He later graduated with an MFA from the University of Wisconsin, Madison. His work is in the permanent collections of the Kohler Art Library, the Zuckerman Museum of Art and the Oregon College of Art and Craft. He has exhibited in venues across the country including the ArtHelix Gallery in New York City, the Ronna And Eric Hoffman Gallery of Contemporary Art in Portland, Oregon, and the Juanita Lowe Art Gallery in Imperial, California. Barbara Foster will be working on her new print projects at the center from April 17 through May 26, 2017. Within an archeological context, she bridges environmental and ecological issues using a personal approach combining traditional and non-traditional processes. During her residency, she will be exploring the UCSC Natural Reserves and working with UCSC students. Barbara Foster was educated at UC Santa Barbara and San Francisco State University then trained as a professional printer thus developing a strong sense of the place that printmaking has in the visual arts. She is the recipient of a Fulbright Award- Taiwan, 2014. She will continue collaborative ventures in traditional and non-traditional technologies in print and drawing that lie at the heart of her studio practice, stretching content and process to address critical issues and intellectual pursuits. 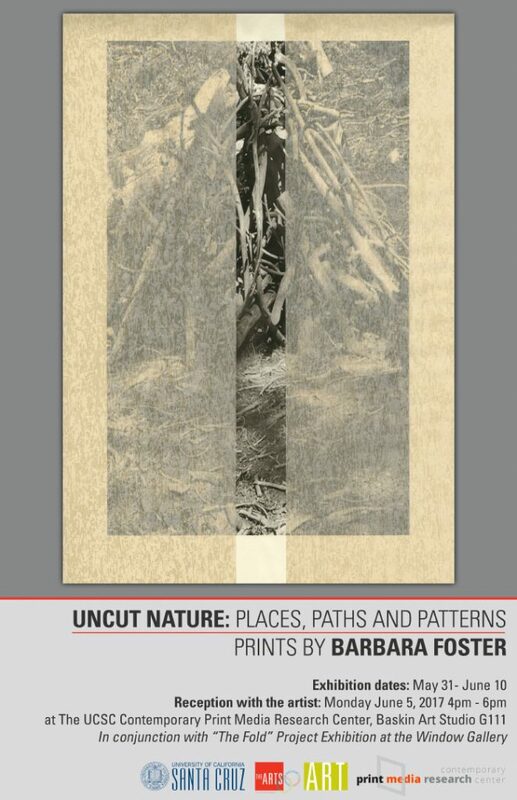 Barbara Foster is widely recognized for her innovative prints. She has exhibited her prints at institutions in the US and abroad, and has completed artist residencies at the Frans Masereel Centre in Belgium, the Phillip Institute of Technology in Australia, the Kala Art Institute, the Djerassi Resident Artist Program in Woodside, CA, the Prairie Center of the Arts in Peoria, Illinois, the Ucross Foundation in Wyoming, and Playa Oregon. The Paper Trees prints were developed for and shown in Digital Mixed Media at the Bumpodo Gallery in Tokyo. Other exhibitions include Tracing Journeys: Mapping as Metaphor at the Paris Gibson Square Museum of Art in Montana, Mapping the Imagination, The Mathematical Sciences Research Institute, Berkeley, Cross Cuts: The Contemporary Woodcut, Kala Art Institute, to name a few. Her work is in the collections of the Awagami Paper Factory, Machida Print Museum, Japan, The Contemporary Museum, Honolulu and most recently The National Library of the Netherlands at The Hague. 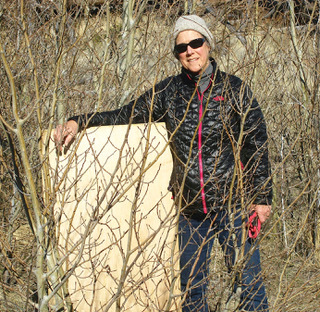 Over the past fifteen years her work has addressed the fragility of the landscape, whether it is the Nevada proving grounds, deep-sea terrain, corporate agriculture, Taiwan urban gardens, or the planting and harvesting of trees as a way of looking at the resurrection of the previously blighted or the implications of the unpredictable. In 2016 Barbara was invited to participate in a residency at the Sagehen Field Station, operated by UC Berkeley. Sagehen and the Art and Environment Center at the Nevada Museum of Art in Reno, Nevada designed this residency. New work and process has been integrated into Barbara’s prints and practice. In 1980, Barbara Foster & Jack Stone launched WesternWedge as a traditional print atelier, printing for artists Bryan Rogers, Margo Humphrey, John Ihle, and Wes Christensen to name a few. Disbanded in 2016, WesternWedge had evolved into what is best described as an intellectual umbrella covering a diverse range of artistic activities. Our website tag line captured our collaborative mindset: Experimentation is an intrinsic part of the arts; art owes its future to past innovations. 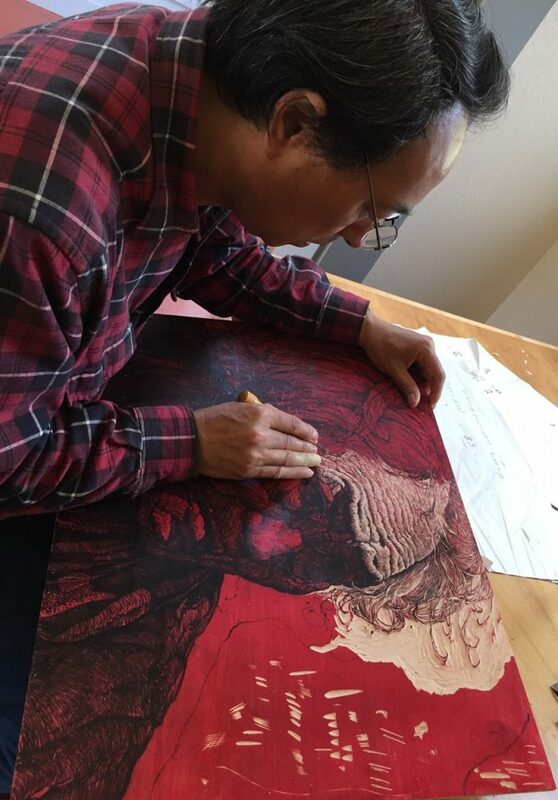 A professor at the Fine Arts Institute of Sichuan Normal University in Chengdu, Xiang Silou carried out a month-long residency working in the center’s newly created visiting artist studio from April 20th through May 20th 2016. 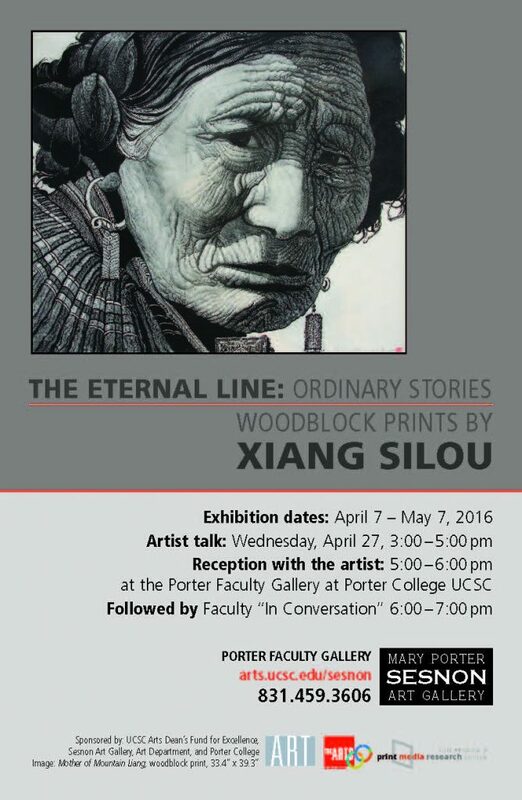 Silou created two new woodblock prints and held workshops and classroom demos for UCSC students.